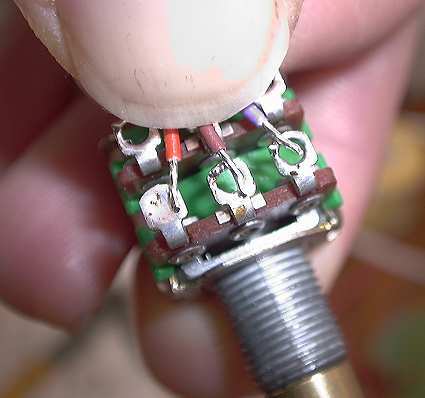 A soldering tutorial for the mechanically challenged. No modern rock musician is complete until he or she has mastered the simple art of soldering a piece of wire to the lug of an output jack or pot inside his/her guitar. The artist at once becomes eternally liberated from the nagging fear of showing up at a gig without a working guitar cable. They become empowered to overthrow the firm grip on their pocketbooks by those high priests of guitar repair. They come one step closer to the abyss of Geekdom. Nothing seems more difficult, frustrating or dangerous to the uninitiated than the clumsy wielding of a very hot and blunt implement against the odds of metallurgy in a concerted campaign to join three metals in an enduring, conducting union. Trust me, you too can solder with a little reading, a small investment and a little practice. i.) Get a respectable soldering iron from the ubiquitous local Radio Shack or hardware store. Get one that has between 15 and 45 watts of heating power. The better irons have interchangeable tips that are iron-clad copper with silver plating. Avoid like black death, the iron with a two prong element that plugs into the handle and is locked in place with a plastic ring. This element will break in half the first time you really need to do something in a hurry, not worth the decades in prison for torching Radio Shack in a justified rage. ii.) 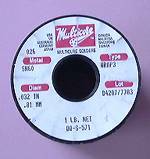 60/40 rosin core solder in "Multi core" fine size or equivalent. iii.) An old damp sponge or damp cotton rag. vi.) A clothespin, pair of Visegrips or small clamp of an improvised nature. vii.) A good light or two, I like to use those drafting table lamps with the springs and creaks. viii.) Steady hands (martinis all around?). ix.) A calm, unhurried environment... OK forget I said that. I first learned to solder from my older brother at about age 10. The process is so simple that it seems trivial in retrospect but if you don't follow the simple rules you will probably never succeed. 1) Plug the soldering iron in for about 2-5 minutes until it has reached the necessary temperature to melt solder (500-800 degrees). 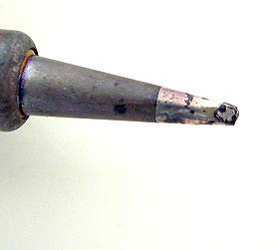 the tip with fresh solder. 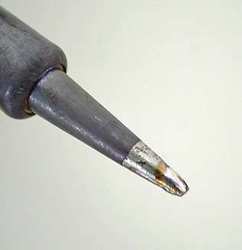 Don't over do it, you just want a little blip of solder on the tip once the whole tip has been freshly coated. If you have a big drop wipe off the excess onto the sponge. 3) Apply the blip on the tip to the end of the wire you wish to solder (after you have stripped off some insulation) and simultaneously apply more solder to the opposite side of the wire using your other hand. (Have you noticed that you don't have more than two hands and that they are already occupied in holding the soldering iron and the wire? This is where soldering gets it's bad reputation so now you have to improvise. 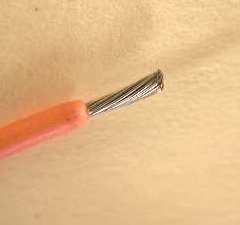 You can hold two things and leave the third to fend for it's self on the table or you can make an attempt to anchor it down with the clothes pin or Visegrips or a small paper weight...) You are "tinning" the wire. 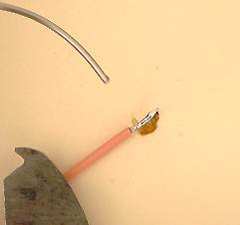 4) Next, "tin" the lug of the pot or jack or whatever it is you want to solder the wire to. 4 1/2) Now is a good time to wipe the tip of the iron off again and apply a fresh coat of solder. apply the soldering iron and solder to the joint simultaneously and watch as miraculously the solder envelopes the whole thing in a little puff of white smoke while you choke uncontrollably on the acrid fumes and worry about lead poisoning. (Did you count how many hands you needed for that simple operation? Yes that's right 4 hands). Like any tricky operation, you need to spend a bit of time preparing the O.R. first. If I can't get fresh solder into the joint as I'm heating it with the iron, I might put a big blip of solder on the tip and let that flow into the joint. You must move quickly though before the blip gets skinned over with a nasty oxide that will mess up your joint. a.) Clean everything before during and after each joint (keeps the DEA happy). That means using fresh wire, fresh solder, fresh parts. Remove excess solder and rosin from the finished joint. Scrape or sand old wires and lugs until they shine. b. )Don't use "ACID CORE" solder for electronics applications, it will degrade over time as the acid eats into the joint. Rosin and acid are called "fluxes", they help clean away the last traces of oxidation from the hot metal and keep oxigen away. c.) The damp sponge, as well as cleaning the soldering iron tip, helps keeps the soldering iron from getting too hot and messing up stuff like transistors and intergrated circuits that are heat sensitive. d.) You can't heat up an old joint or a new joint without putting the little blip of fresh solder on the soldering tip first, it helps the heat flow into the joint. e.) Molten solder will always move towards the hottest part of the joint, I don't know why but it just does. This can be used to your advantage if you really are clever. f.) Soldering is nearly instantaneous, if the solder doesn't flow around the work in 1/4 of a second then something is wrong and you need to start over again. g.) Test everything right after you solder. Don't unplug the iron first, as that will guarantee that you screwed it up. h.) Don't let the joint move until it has cooled enough to set, it should look mirror shiny all around. What this means is careful setup and "jigging" of the wires and parts so that everything is held in close alignment while you concentrate on the iron and solder. i.) Don't inhale that smoke, it might be bad for you. I'd use a little computer "muffin fan" to blow it away from me but I don't have one.. j.) Practice. Practice. Practice! Remember that your new skills won't help you if you don't have your tools with you on the gig. k.) Reward yourself for a successful soldering adventure with a beer or three, you deserve it (but wait until after your first set maybe).